Looking for some opinions on a possible rebuild to the bike I've owned the longest (from new). The last change I made to my ’83 Trek 600, what they used to call a sports-touring bike, and originally a 6 speed with a double in front, was to make it more suitable for bike touring by changing to a 7 in back and a triple up front, which gave me granny gearing. The frame wasn't built for loaded touring so isn’t stiff enough to perform well like that but there you go. I made do. Now I’m thinking about revising this bike again. I haven’t done any loaded touring in a long time, and if I were to again, I would finally buy a true tourer. I use this bike for long, solo, meandering rides outside the city and sometimes riding in the city. I’m not a club or fast rider. I was thinking of simplifying the bike by making it a single up front with a wide-range 7 speed cluster in back. Although my rear hub, being old, uses a freewheel, not a freehub, it’s an excellent hub in perfect shape and I don’t feel like changing it. So I wouldn’t be spreading out the rear triangle to fit a wider axle and more gears. Just stick with seven. Shimano make a seven-cog, 34-14 freewheel. I’m thinking that with a 44 tooth chainring (can I get a single with a 44 tooth chainring?) I’d have a low of under 35 gear inches and a top of 84 gear inches. That might be fine for the sort of riding I do. Does this seem like it would work well? The friendly folks at the Classic & Vintage forum deal with gearing questions on older bikes everyday. I ran a 44 chainring with an 12-27 cassette on a commuter bike. It worked well enough in Chicago where hills are nonexistent. Where do you ride? You'll need some way to keep the chain from falling off the chainring. Ironically, using a front derailleur as a chain keeper is cheap and effective. Last edited by Barrettscv; 03-07-19 at 09:58 AM. The 1983 600 is a very nice frame/fork - Reynolds 531c triangle - and worth spending some $ on to make it what you want. Do you have the 'vermillion red' or the 'pewter'. Post a pic. To your question, there are some nice ride routes just north of the city in Westchester, Putnam, and Rockland - you'll be able to ride over the new Tappan Zee bridge soon - but the area is hilly as you know. A 44-34 low gear is pretty tall. And the last jump on the 7 speed (14-34) freewheel is a big one - from 28 to 34 - not a natural-feeling - but the other 6 ratios should be pretty normal when changing from one to the next. If you don't want to spend much money then the 7 speed freewheel will give you the big 34T cog - if your RD can handle it. And if you only want one chainring then a 38 or 39T will give you the ability to pedal at a reasonable cadence up to around 22+ mph - and give you a somewhat lower climbing gear. Another possibility - and I have proposed this many times before of BF - is a MTB double up front. I find a 39-26 crankset paired with a 14-28 freewheel to be just right. You get a sub 1:1 climbing gear and can still pedal up to 22+ mph comfortably using 39-14. You can probably use your existing DT shifters to run the RD and FD with 9 speed chain even though you have a 7 speed cassette (double check on the BF Bike Mechanics page before buying a particular crank). Or, bite the bullet and get a new 10-speed wheelset (130mm) with a 10 speed cassette. The wheel should fit into the 126mm spacing on your bike with a little effort - I have done this on an '85 Trek. Velomine has decent 10 speed wheelsets for around $200. You will need a new RD and some way to shift it. I like indexed DT 10-speed shifters on 'vintage' bikes. You could also use brifters or bar-ends. This option is a big jump in money (maybe $400 if you do the work yourself), but your bike is worth upgrading. Good luck and check back with your solution. 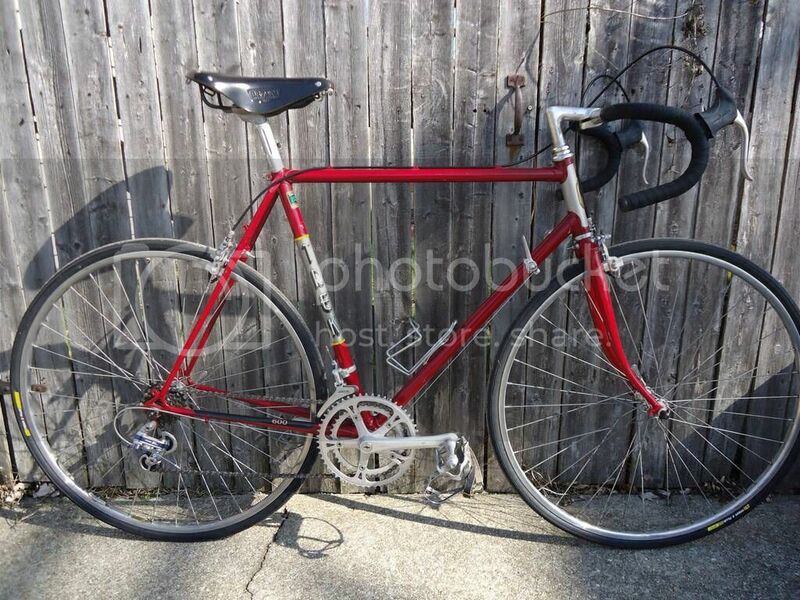 I found this photo of an '83 Trek 600 on the web. Thanks for pointing out the need to hold the chain on the ring. My folder has retention built into the bike so I should have realized that requirement. Yes, that's my bike when it was a newy, the red one, although mine is the frame size next up. And every component, even the headset, is different now, although I also have the B17 saddle. (Mine is a mess right now and would be embarrassed by having its photo posted.) It could be I am thinking too wishfully about banishing my granny gear, which with my setup now is 1:1 so approximately 27 gear inches, and there are certainly places I ride in Orange, Sullivan, and Rockland counties where I use it. I will give some thought to the MTB double. It's helpful to post something to a forum; the replies are substantive and there's an expression someone said, No one knows what they mean until they hear how it sounds (or maybe looks on the screen all typed out). You're so right that local riding will be transformed dramatically with the bike path on the new bridge. A lto depends on your normal speed and your happiest cadence. I have the 14-34 cluster on an old Cannondale with a 48-38-28 triple up[ front, and find I spend a lot of time in the top half of the cluster---of course, I average a blazing 15 mph. On another hand, when I am tired I sometimes go way into the bottom of the cassette on bikes gear 50-34 and 11-28 .... so 44x34 might not be low enough. If you pedal sort of quickly and don't travel too quickly, the MTB double sounds like a good option. ---of course, I average a blazing 15 mph. Yes, I too have to escape the brush fires I start at the road side from my sheer speed. My last long ride was an arc that followed the ridge of the Shawangunk mountains from Otisville to Poughkeepsie and I averaged maybe 10 mph. But I enjoyed every minute of it. Have you tried the carriage roads in Minnewaska State Park (west of New Paltz on State Route 44)? You can ride from the park entrance all the way over to Ellenville - probably 30+ miles of packed-gravel roads and no cars - just need to watch out for the occasional horse and rider. I lived for many years on Underhilll Ave. between Sterling Place and Park Place. I worked at the Grand Army Plaza public library. That was a sweet commute. I would personally want more than a 1x7 for meandering rides in Ulster County or thereabouts! I'd probably use most of the combinations of a 28/38/48 triple x 11 - 34 Mega-range 7sp. on even a short outing. YMMV. Hah! I hang my hat on Plaza street east. I owe the liberry $6.50 in fines. (Recent. I pay up before too long.) Yes I have pretty much accepted that I need to keep the bike a triple or make it wide range double if that is possible. No! But I have checked them out many times on a map. This is a must-to-do. Can you use the carriage roads to connect with Sams Point? The map shows that the 'High Point' carriage road leads from Lake Martanza (near Sam's Point) up to other trails on the ridge that lead all the way over to the park entrance on route 44. However, there is a short section of the Loop Road trail that must be traversed from the Sam's Point parking lot to reach the High Point carriage road. I assume that Loop Road is ok for bikes - call the park office to be sure about this. 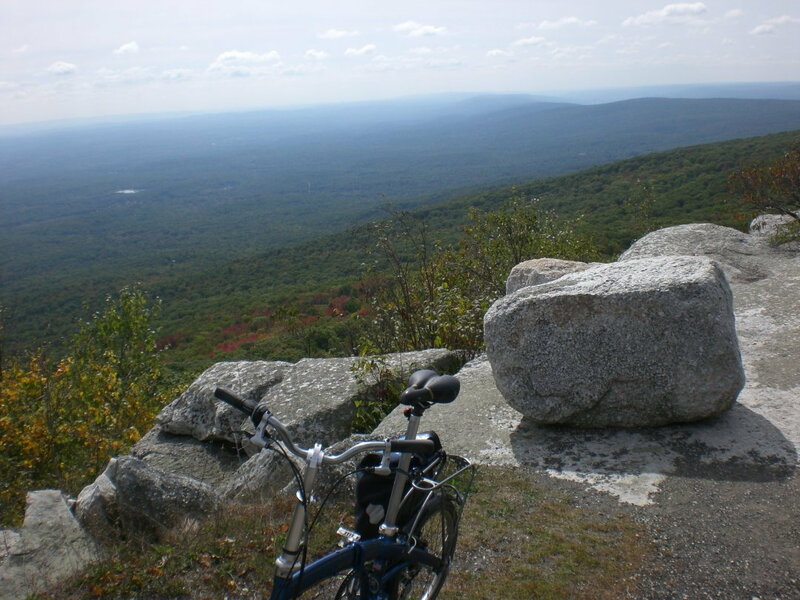 I have hiked in Minnewaska but never biked. I can say the carriage roads I have hiked on looked very nice for riding. A mountain bike would be good - but a drop bar bike with mid-size tires (32mm+) and low gears might be ok - another good question for the park office assuming they know the answer. I've been on the piece of the Loop Road that climbs from the visitor center to Sams Point. It's unimproved, but it's a road. I was on my little foldcycle and had no trouble at all with the surface and no one told me I couldn't ride there. (Photo proof below.) So Loop Road to High Point carriage road--it should work. I spotted Smiley carriage road from Berme Rd, the route I used between Ellenville and Rt 44, but didn't think at the time what I was seeing. I was using the Trek for that ride. Jeez, I'm kind of psyched just thinking about it now. jlaw, I just received a package of NY/NJ Trail Conference maps for the Gunks and have been disappointed to learn that there are no carriage roads (where bikes are allowed) between Sam's Point / Lake Awosting and Lake Maratanza, except for a short section to the NE of Maratanza called the High Point. These maps contain information I didn't find on the park websites, which is that the unmaintained carriage roads, now called woods roads, of which there are quite a few and which might make the traverse possible, are closed to bikes. Too bad, but maybe for the good of the park it's better to keep visitors traveling mostly on foot. I suggest a call to the park office just to make sure. That's a good idea. If I learn different, I'll let you know. your double crank is a little off chainline center..
chainline center is the gap between the 2 chain rings , or the middle of a triple..
My thinking at the moment is a wide-range double, but I will put updates here. First, the frame needs repair, and new paint.